Alaska began forming about 2 billion years ago. Geologists have found rocks that old in Southwestern Alaska. Some rocks found in Interior Alaska are 500 million to 1 billion years old. These are some of the oldest rocks found on Earth. From the Cambrian Period (570 to 500 million years ago) through the Devonian Period (408 to 360 million years ago), Alaska's waters and seas were warm, mountains were growing, and animal and plant life were expanding. 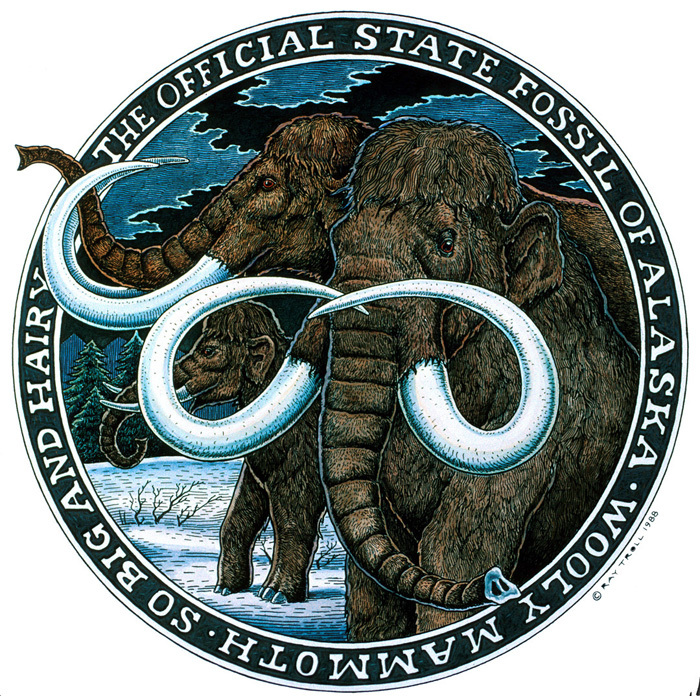 During the Carboniferous Period (360 to 328 million years ago) through the Permian Period (286 to 245 million years ago), Alaska began to cool. Also, at this time some of the oil and mineral deposits we are mining today began to form. Dinosaurs roamed parts of Alaska from the Triassic to Cretaceous periods (245 to 65 million years ago). The fossil of a shallow-water ichthyosaur was found in Ketchikan in 1969. A footprint of a theropod dinosaur was found in 1975 near Chignik. The shape of Alaska began to look more like it does today. The Brooks Range began forming. Volcanoes of the Alaska Peninsula were erupting. Rocks containing gold found their way to Nome, Fairbanks and western Alaska. Swamps of Southcentral Alaska formed into coal-bearing sandstones. Other oil and gas deposits formed. Alaska was transformed from a tropical land and humans began to appear. Coast and Alaska ranges rise and glaciers began to form in the southern mountains as the land began to cool in the late Miocene Epoch (23 to 5 million years ago). In the Pliocene Epoch (5 million to 2 million years ago), permafrost developed in the Interior, forests became more varied, and oil collected in the upper Cook Inlet. During the Pleistocene Epoch (2 million to 10,000 years ago), mammoths, lions, horses, saber-toothed cats and even camels roamed the Interior. Near the end of this epoch, sea levels dropped, exposing the Bering Land Bridge, which allowed people to cross into Alaska from Siberia.